On September 25, State Councilor Dai Bingguo, who visited Britain for the China-UK strategic dialogue, came to the Sunshine School of the Chinese Embassy to see the teachers and students in the company of Ambassador Liu Xiaoming and Madame Hu Pinghua immediately after his arrival at London. 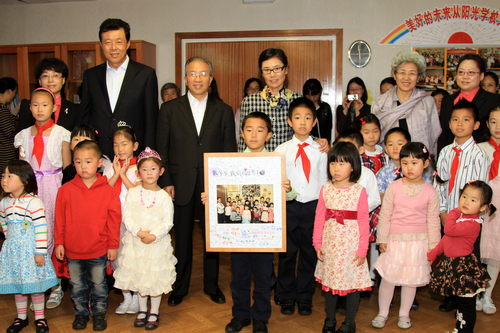 Nearly 20 children of the School were looking forward to Mr. Dai's arrival together with two teachers and parents. "Hello, children!" Mr. Dai stepped into the brightly lit classroom with smiles. "Welcome, Mr. Dai!" 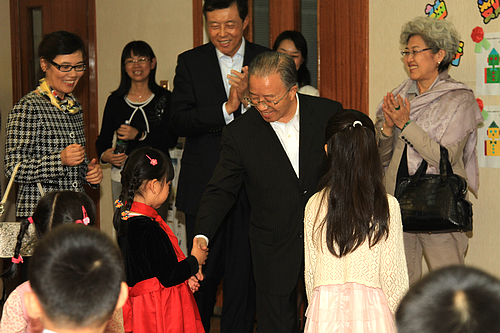 The children crowded around the State Councilor and expressed their joy. They also presented to Mr. Dai a gift carefully prepared by themselves - a photo of all the children in the School, who smiled as brilliantly as the sunflowers in full bloom. Decorating the photo were the children's creative drawings and their attentively written good wishes. With the gift in his hands, Mr. Dai thanked the children. He kindly cuddled them and affectionately asked, "How old are you? ", "Can you speak English yet?". The State Councilor also carefully asked Madame Hu Pinghua, Headmaster of the School, about the teaching of the Sunshine School. 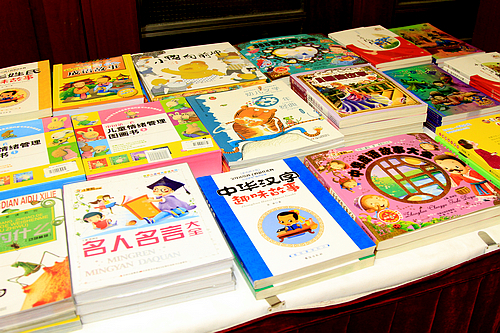 Madame Hu told Mr. Dai the achievements in the School's history of development from a Chinese class to what it is today, and said the Embassy would better use the available resources to overcome difficulties and create a good learning environment for the children. Mr. Dai encouraged the children to cherish the opportunity to study and make progress every day. The teachers and children also prepared another pleasant surprise for Mr. Dai - the dance "Happy Festival" choreographed by themselves. As the music was on, the children danced cheerfully. Though their moves may be immature, their seriousness and confidence deeply impressed everyone. After watching the performance, the State Councilor praised the children for their dance and presented to them the gifts most needed in the School - the books and audio-visual products for children. These gifts made the children even more excited. Indeed, Mr. Dai’s visit was a happy festival for the children.